AC died in October 2007 at the age of 88. He had led an interesting and distinguished life and was devoted to Sherborne. I knew him from the time he joined the governing body and am indebted to a number of obituaries for information on his earlier life – in particular he left a comprehensive autobiographical note covering his life up to the end of the war. He was a prolific obituarist himself and would have quickly taken his red pencil to this contribution. AC joined the Foreign Office in 1946 following demobilisation from the army, and served in Singapore, China, Italy, France, Ethiopia and America. He was at various times Private Secretary to the Parliamentary Under-secretary and Assistant Head of the news department and he served on the Mission to the United Nations. He was Head of Chancery in Paris to Christopher (later Lord) Soames with whom he had been at pre-prep school. He was Ambassador to Ethiopia from 1969 to 1972 and to Italy from 1976-1979, when he retired. In between these two ambassadorships he was Deputy Under-Secretary at the Foreign Office and Political Director. By any standards this was a glittering career at the end of which he was appointed GCMG. He was brought up in a country house, Combe Royal, near Kingsbridge in Devon, close to many Ilbert and Campbell relations living in nearby Thurlestone and Bantham. Throughout his life, when in England he returned to this beautiful part of the county when possible. From the age of six he was at boarding school and in 1932 he entered Sherborne as a scholar, following his elder brother Peter (killed in Sumatra in 1942). He went (via Elmdene) to School House where a contemporary remembers him as “neat, clean and tidy” and as sharing study number 3 with A.J.G.Crocker, another scholar who remained a friend in adulthood, and one who also rose high in government service. AC described himself in his memoir, entitled Colleagues and Friends, (published 1988) as “good at games and latterly captain of the cricket and football teams”. This was at pre-prep level. Sherborne in his time was obsessed with rugby football which may not have helped AC who was not tall. However he excelled at tennis, captaining the school team and winning the Public Schools Doubles, partnered by Alastair (later Sir Alastair) Pilkington. He shone at modern languages, winning most of the relevant prizes, and was awarded a scholarship to Caius College, Cambridge. Here he got a first in the “Mays” but the war then intervened. AC joined up as a private in the Suffolk Regiment in 1940, and finished the war as a major in the Devonshire Regiment. A somewhat boring period of service in the Education Corps was alleviated by secondment to the Intelligence Corps. After training on the Highland moors near Arisaig, he worked for SOE, in Beaulieu, Hampshire, training French agents, and later in London, working with various resistance groups in France – although to his chagrin he never served in enemy occupied territory. In 1945 he spent time in Berlin in SIS, at first as Hugh Hunt’s deputy and then in charge of intelligence gathering. In 1973, probably sponsored and persuaded by Viscount Boyd of Merton (OS, former Secretary of State for the Colonies and Chairman of Governors) AC joined the board of governors even though it was recognised that his attendance might be curtailed by overseas service. It was a shrewd and timely appointment – these were difficult times for the school and cool heads were needed. To quote a more recent Chairman, Sir John Weston, “AC displayed the same humane commonsense and practical wisdom as a school Governor in that overheated crisis atmosphere as he was doing over the same period in the Foreign Office, as its first Political Director…. He had a masterly gift for keeping his head when all about were losing theirs”. In retirement AC took on a number of commercial and charitable appointments but fortunately for the school he was persuaded to become Chairman of Governors from 1982 to 1987, serving for the last years of Robin and Petronella Macnaghten’s reign; they made a powerful and congenial team, and became good friends. 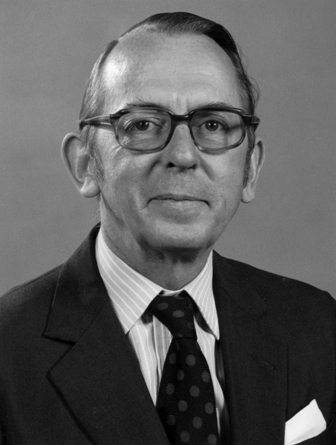 He was President of the OS Society in 1981. It was easy to see why AC had such a distinguished career. He shone both academically and intellectually. In appearance he was invariably dapper and beautifully turned out. He seemed to know everybody and everybody knew him – he was blessed with an encyclopaedic memory for names and the people behind the names. He had an old-fashioned courtesy and was a wonderful host – whether dining at Brooks’s or dispensing afternoon tea at Carlisle Mansions. He was married for 52 years to Margaret who was a wonderful support in his professional career and to whom he was devoted and who he supported tirelessly through her last illness. They had three daughters, and two grandsons, all of whom have inherited some of his artistic talents and interests, for he was a good water-colourist and had a fine collection of paintings. He was rightly proud when one of his paintings was hung in the Royal Academy Summer Exhibition. Sherborne has lost a great friend and servant.